Made in the United States, our soft, supple, triple-strand twisted cotton rope by the foot is perfect for any use. Horse tack, macrame projects or tug-of-war and outdoor fun, this is absolutely THE softest rope out there. With Ravenox rope you'll achieve a natural, vintage look every time. Ravenox cotton rope is easy to tie in knots and splice making it one of the most versatile materials for do-it-yourself projects, outdoorsmen, arts and crafts and everyday use. Made from the softest of natural fibers, our cotton rope avoids the discomfort caused by other types of rope. Perfect for anything from horse leads to hammocks, our rope adds a personal touch to any project. If you are looking for a unique color combination you can also create your own personalized rope. 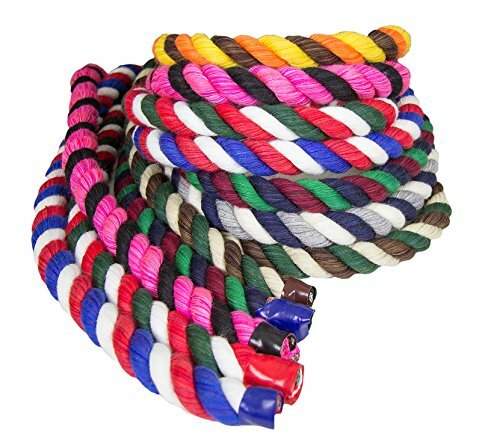 Choose three options from our wide range of vibrant colors to create your own Custom Rope. Horse leads, pet toys, wedding decor--the possibilities are endless. Please be aware that while our three-strand cotton rope is true to diameter on the spools, fibers may expand when the rope is cut to length and shipped. Please consider ordering a sample pack for use with any application where very specific sizing is a concern. Ravenox Twisted Cotton Rope and Twine is available in 1/8-inch, 3/16-inch, 1/4-inch, 3/8-inch, 1/2-inch, 5/8-inch, 3/4-inch or 1-inch diameter in multiple colors and lengths. Sample packs are available If you aren't sure which color and size might be right for you. STRONG TRIPLE TWIST: Horse leads that last, dog leashes that won't snap and durable hammock rope to hold heavy weight- this triple twist engineering has no limits! A great rope for the outdoors since it's not susceptible to UV damage like synthetic rope. 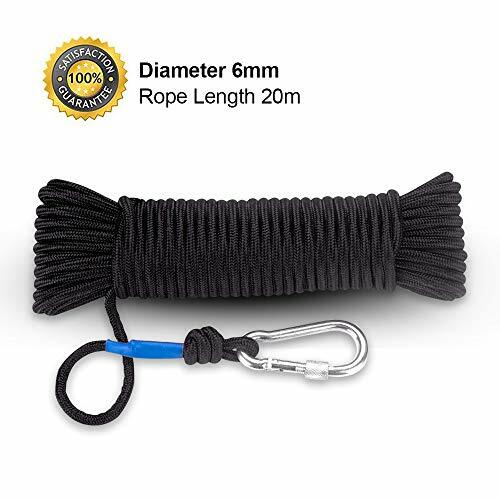 YOUR LENGTH & WIDTH: Order the amount you need with rope by the foot in 10 Feet, 25 Feet, 50 Feet & 100 Feet and rope by diameter with 1/8 inch, 3/16 inch, 1/4 inch, 3/8 inch, 1/2 inch, 5/8 inch, 3/4 inch & 1 inch thickness. Our cotton rope is always true to size when made in our shop, but since cotton is a natural fiber the diameter and length may adjust depending on the application. 100% RISK FREE PURCHASE. Ravenox is a CERTIFIED Service-Disabled Veteran-Owned, Women-Led American Small Business that backs all of its' products. If you're not 100% satisfied, you'll get your money back. Ravenox rope meets the rigorous manufacturing and testing procedures set forth by the American Cordage Institute and we are proud to be 1 of only 29 manufacturers in the world that helps set the standards in rope manufacturing. This Rope is Made in the USA. About Wukong braided Rope is a must have item for every home, farm, car, truck, marine, canoe, well, flagpole, backpack, and gear collection. It is heavy industry duty, made of tough Nylon and capable of withstanding damage from the weather, with great resistance to chemical exposures like petroleum, rot and mildew. High Quality--braided Rope, Strong Silk Skin Polyester Core. Heavy duty construction to withstand weather damage, Superior abrasion resistance and Resistant to most chemical exposures like petroleum, rot and mildew, No loss of strength when wet. Tie, Pull, Swing, Climb and Knot. Winches, Dock rigging, Blocking, Flagpole lanyards, Tent guide lines, Clothes lines, Craft/general purpose Tie Down, Boat dock and Mooring lines, Horse halters and reins, Dog Leashes, Art and decorative, Scout knot tying construction, Awning Tie Downs, Ropes Course Construction, Anchor lines, Hammock, Swings, Deck/Dock railings, Golf courses, Crowd control, Water and Snow Ski Ropes, Pool safety & decoration Rope, Decorative Knot Work, Guy Rope, Pet toys, Extremely Long Lasting Synthetic Cabling, Truck cargo Tie down, Electrical Underground Pulling Line, Guy Lines pulling, Halyards, Slings , Knot Tying Classes, Equine Use, Exercise Rope (battle rope, undulation), or simple household applications. The Product Description field contains an invalid value. Please provide a valid value for the field and try again. High quality polyester material, very strong and durable, resistant to tear, fading, rot and mildew; Not easy pilling and keep good braking function. 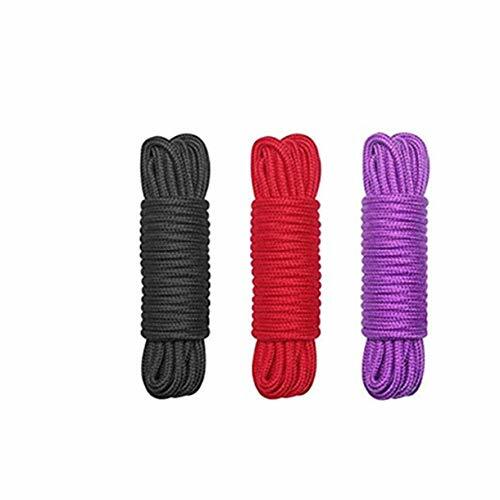 Can be rolled up to a small part, easy to tie knots, very compact to carry it with you; Wukong premium braid rope are with great resistance to chemicals, rot, mildew, UV rays and water. The all-around durability of nylon rope makes it useful for any job in any situation. Use it on your farm, boat, ranch, construction site, or home. Widely application :They are perfect for magnet fishing, escape, camping, hiking, boating, fishing, caving, engineering, hand and utility lines, pulling and stringing lines, secondary mooring lines, Stage, Event, and Special Effects Rigging, Trawl or Bridle Line, Winch Line / Utility and more. 100% satisfaction guaranteed and friendly customer service. Please contact us when you get the defective products. REFUND and REPLACEMENT will be offered with no question asked. 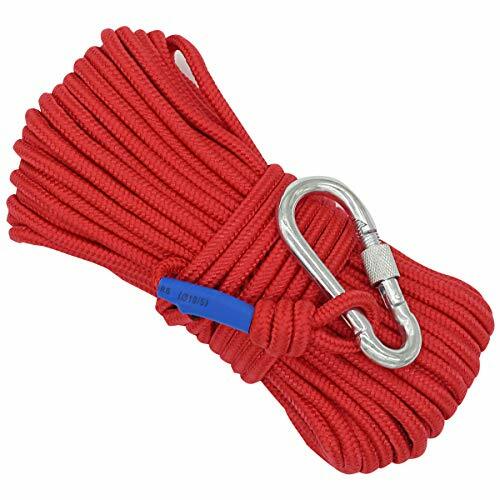 Xben multipurpose ropes are best for rescue work,caving,hiking,rappelling,rock climbing,tree work,indoor/outdoor life safety rope,climbing fixed lines with ascenders and hauling loads. Static ropes excel in situations where you don't want the rope to stretch, such as when you are lowering an injured climber, ascending a rope, or hauling a load up with the rope. 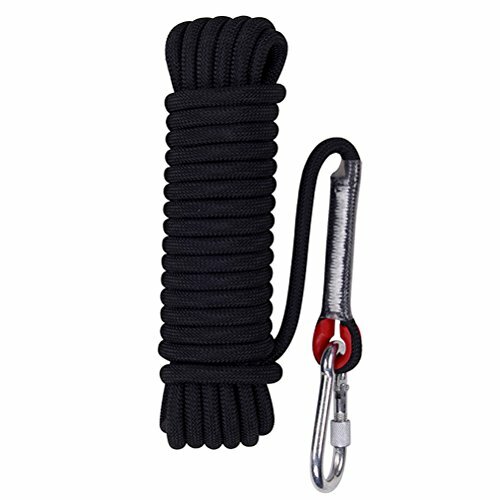 --The diameter of the rope is 8mm,lightweight and compact. --Unlike the others cheap plastic thimbles rigging, we used heavy duty stainless steel thimbles rigging that you won't worry about the split of thimbles rigging which will damage the rope , even your safety. --LOWER STATIC ELONGATION: Static elongation measures how much a rope stretches with a 176 lb weight tied to one end. A good percentage is right around 7 percent. Higher static elongation generally indicates less efficiency because energy is wasted through rope stretch. A burly rope designed for heavy use and year-round climbing, the Black Diamond 9.9 boasts a thick diameter for your varied climbing life. Nite Ize is known for creating products that make enjoying nighttime activities safer and more fun. Our Reflective Cord Pack makes campsites and job sites safer for everyone. When you're out in the elements at night there are enough hazards to navigate without worrying about losing sight of what you've got tied down. Nite Ize Reflective Cord comes in a 50' (15.24 meters) length of 2.44mm cord and weighs a mere 2.43 oz. It is perfect for things like tent guy lines, hanging bear bags, boating, tying up tarps or shelters, and then being able to see where it is when you're done. Made of sturdy nylon with a special reflective strip woven into it that reflect brightly when light is shined onto it, the Nite Ize Reflective Cord increases safety for you and the people around you on the trail, campsite, water, and highway. After all, the only thing more important than ""knowing the ropes"" is being able to find them! Nite Ize has been creating innovative, solution-based products with quality, performance and value at the core for over 25 years. Based in Boulder, Colorado, we aim to continue offering imaginative and innovative products that make our customers lives easier, safer and more fun. TOUGH NYLON CORD - Made of sturdy nylon cord with a special reflective strip woven into it. Use: Mountaineering,Rock climbing, Rescue, High-altitude work,Engineering protection,exploration, relief work. Made of high strength polyester yarn, strong, durable and wear-resistant. The core of the rope is made of Polypropylene,which is easy to carry. With firmness hooks on the end, provide you safety and reliable environment. High-end machine sewing, tightly woven, thick knit. High tensile strength, low coefficient of friction. There have protective case at the end of the sewing button,which can protect the rope from cracking. 6.Don't lend the rope to others: It is dangerous to use the rope which has crack, and you don't know it. Multiple Length Options - POWER GUIDANCE climbing rope are available in 4.5m, 6m, 7.5m, 9m, 10.5m, 12m, 15m. Made of high strength polyester yarn, strong, durable. it could bear different kinds of friction with branches, rocks. Due to its all high tenacity polyester material, it is quick drying and soft . which is adaptor to wild environment. High tensile strength, low coefficient of friction, which is easy to tie knots in outdoor activities. Rope is a must need tool that should always be with you. Whether you are camping, hiking, driving, or trying to survive, rope is your best friend. It has uses from hanging clothes, to securing your shelter. This rope is lightweight and easy to store. It is 3/8 inch braided nylon to add that extra strength. There is no reason to not have this rope in your car, survival kit, or backpack. This rope is NOT intended for rock climbing or rappelling. 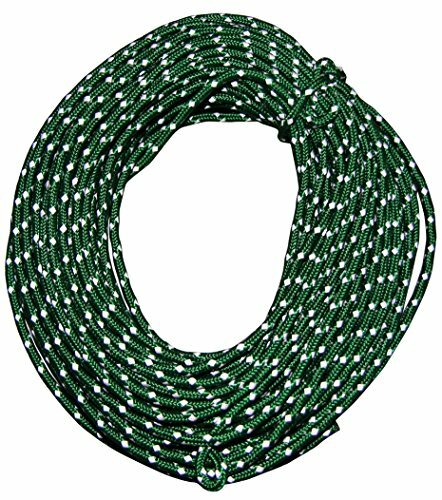 VERSATILE AND DURABLE: This 50-foot, 3/8 inch dynamic camping rope is an item everyone can find use for. 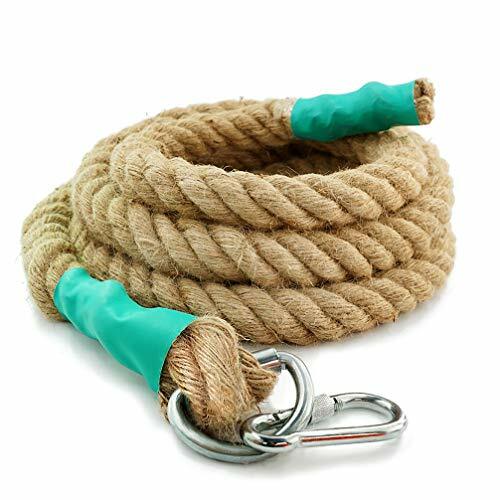 Whether it's hanging clothes, constructing a shelter, or securing an item to your car this multi-use, shock-resistant rope is a practical tool to have at your disposal. ADDED LENGTH: When 50 feet isn't enough it's simple to extend your rope. The 4 inner cords can easily be removed to transform this 50 foot rope into a 250 foot rope. STRENGTH: This can be used for light to moderate weight objects and jobs. For added strength, this 3/8inch rope has a nylon braided outer layer surrounding 4 inner nylon braided cords. However, this rope is NOT intended for rock climbing or rappelling. 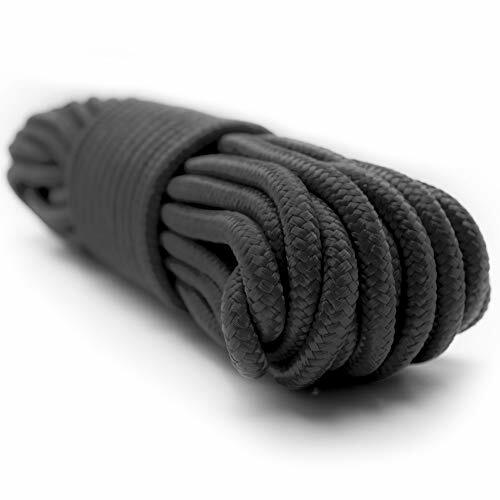 LIGHTWEIGHT: At only 1.5 lbs this rope is light enough to include in your pack for that camping trip, and small enough to fit under the seat in your car. 100% MONEY-BACK GUARANTEE: as a world-wide supplier of emergency preparedness and survival gear, Emergency Zone Brand offers TRUSTED products that you can RELY on. If for whatever reason whatsoever you are unsatisfied with your order we will make it right by you. Product Name: 1pc bundle of rope Material: Nylon,Cotton Hemp. Condition: New without tag Color: (As pictures shown) Size:Are all 20 meter. Material:Woven from environmentally-friendly soft cotton, very durable and firm.no bad smelling.chafe skin. Length:Are all 20 meters.There are three colors to choose from: red, black and purple. This rope can be used to bundle most large objects, bedroom fantasy. It can also be used for camping, rock climbing. Or for the fun of hand-made, packaging, DIY, decorative crafts. Suitable for Christmas, Halloween dress up indoor or outdoor, home gardening decoration. Very easy to use ,long enough and strong enough.Soft and friendly cotton material makes your life more fun. Because of the manual measurement, small errors in measurement are allowed. Small but mighty: With a new sheath and bantamweight core construction, the Helix is Sterling's skinny workhorse. Blending the right featuresthe ease of the 9.5-diameter rope, durable and light with low impact forcethe Helix is ideal for high-end sport, trad and mixed climbing. Made in the United States, our soft, supple, triple-strand twisted cotton rope by the foot is perfect for any use. Rope dress, adornment, macrame, design & decor-this is absolutely THE softest rope out there. With Ravenox Rope you'll achieve a natural, vintage look every time. Ravenox cotton rope is easy to tie in knots and splice making it one of the most versatile materials for do-it-yourself projects, outdoorsmen, arts and crafts and everyday use. Made from the softest of natural fibers, our cotton rope avoids the discomfort caused by other types of rope. Perfect for anything from horse leads to hammocks, our rope adds a personal touch to any project. If you are looking for a unique color combination you can also create your own personalized rope. Choose three options from our wide range of vibrant colors to create your own Custom Rope. Macrame projects, rope wall, interior design, sports & outdoors, pet toys, wedding decor--the possibilities are endless. Please be aware that while our three-strand cotton rope is true to diameter on the spools, fibers may expand when the rope is cut to length and shipped. If your application is dependent on a specific diameter, please consider ordering a sample to verify sizing. Choose between 1/4-inch, 3/8-inch, 1/2-inch, 5/8-inch, 3/4-inch or 1-inch diameter cotton rope in dozens of colors and lengths. Sample packs are available If you aren't sure which color and size might be right for you. EVEN MORE RAVENOX NATURAL COTTON ROPE DIRECT FROM THE MANUFACTURER: If you love our original colors you'll love our tri-color custom combinations. 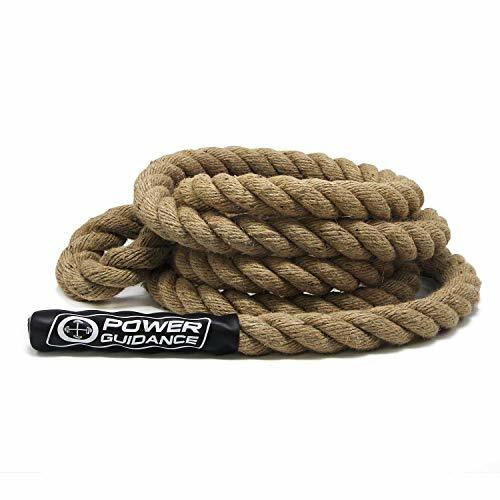 This all-purpose soft and strong rope is made in the USA by our team of rope masons at Ravenox Rope in North Carolina - we are 1 of only 29 American Cordage Institute approved manufacturer members in the world! PET FRIENDLY, CHILD FRIENDLY. 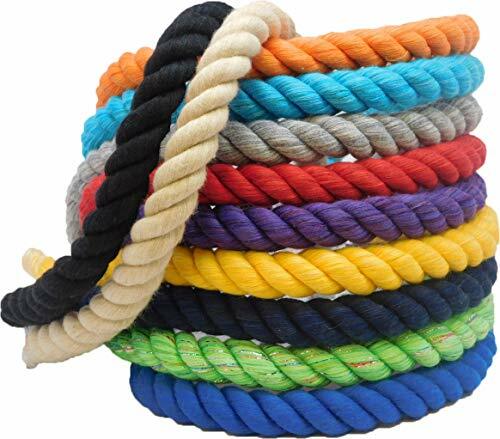 Made with soft, colorful cotton, our natural tri-color twisted rope is safe for craft projects with the kids as well as pet toys for birds, cats, dogs and all your furry friends. Its UV resistant properties make it a great option for horse leads, leashes and even livestock use. If it gets dirty it can go right in the washing machine, but be gentle, cotton can shrink. GET CREATIVE - FUN JEWELRY, PET TOYS, DESIGN PROJECTS, TUG-OF-WAR ROPE. Our high-quality twisted cotton rope is soft, strong and easy to work with. Our wide variety of vibrant colors are excellent for do-it-yourself craft and design projects including weddings, events and interior design. If you need a specific color combination you can also create your own unique custom rope with our personalization options. MULTIPLE LENGTH AND DIAMETER OPTIONS: Order the amount you need with pre-cut rope by the foot in 10, 25, 50 & 100 foot lengths or full spools for big projects. Diameter options for most color combinations range from 1/4 inch up to 1 inch thickness with more options being added everyday. Our cotton rope is always true to size when made in our shop, but since cotton is a natural fiber the diameter and length may adjust depending on the application. 100% RISK FREE PURCHASE: As an American certified Service-Disabled-Veteran-Owned Small Business that values honestly, loyalty and trust we stand behind all of our products. Every Ravenox product comes with a 1-year warranty. BRYUBR Brand focus on great items, let efficient living always accompany you! 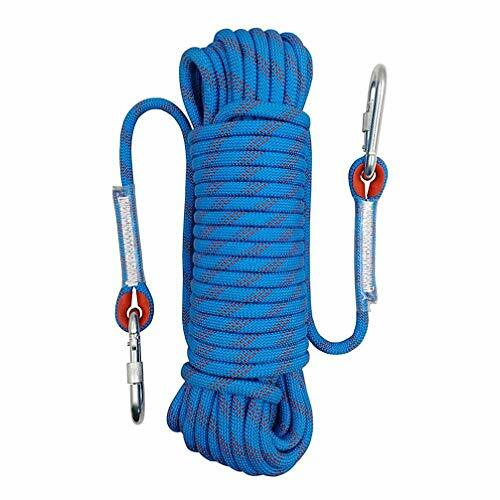 INDUSTRY STANDARD - Outdoor static climbing rope meets the CE standard, the outer skin sliding rate is less than 0.05%, not easy pilling and keep good braking function. The operation is more smooth. PREMIUM QUALITY - Strong quality rope is very sturdy, be made of Polyester of High Tenacity and reinforced inner core, easy to use. Very abrasion resistant and Easy, fast, convenient. 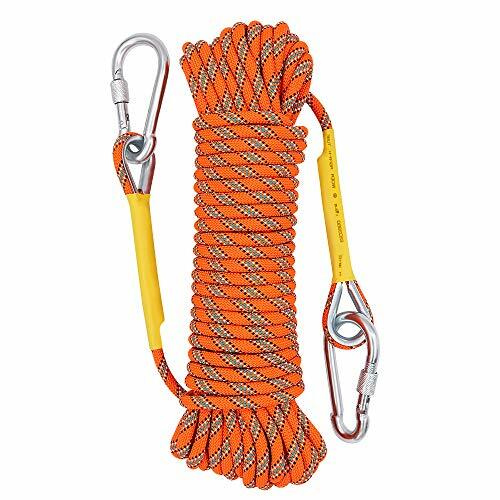 WIDE APPLICATION - Very rigid rope is fit for Escape, Fire Survival, Backup, children's tree swing, Remote packing trips, Camping, Downhill, Engineering protection, Lanyard, Tree Stand Accessories, raining, Auxiliary rope, Caving, Abseiling etc. SIZET - Length - 10 meters( 32feet ), Diameter: 10mm(3/8inch), Weight 60g/m, Max Tensile: 12KN(2645.5lb), Safe Working advice 400KG. 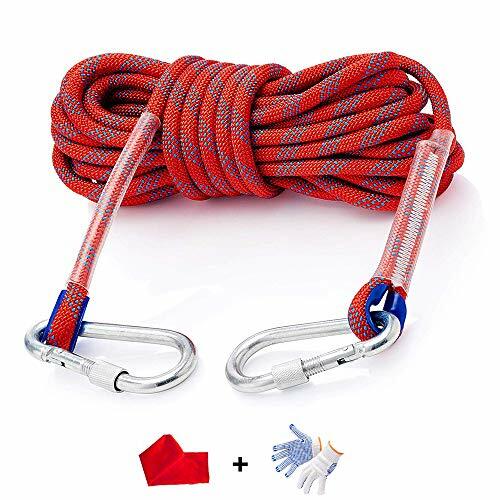 PACKAGE AND WARRANTY - You can get 1 nice static safety line, 1 storage bag, 2 hooks and 1 pair of anti-slip gloves; We provide 30 days refund policy if you aren't satisfied with our outdoor climbing rope as we are proud of our products' quality. Hammock, engineering, hand, and utility lines, pulling and stringing lines, secondary mooring lines, Stage, Event, and Truck cargo Tie down, Trawl or Bridle Line, Winch Line / Utility and more. Nylon braided rope has 550pounds working load limit and is UV, rot, and mildew resistant and absorbs shock. The end of the rope is sealed by a heat shrinkable tube to prevent unraveling. Cotton rope is easy to tie in knots and for do-it-yourself arts and crafts projects and everyday use. Please allow 1-3 cm error due to manual measurement. Thanks for your understanding. Nylon Rope Please refer to the Breaking Strength. Do Not Recommend to use it for rock climbing. Well Made & Durable High quality polyester material, easy to tie knots, very compact to carry it with you. with great resistance to chemicals, rot, mildew, UV rays and water. 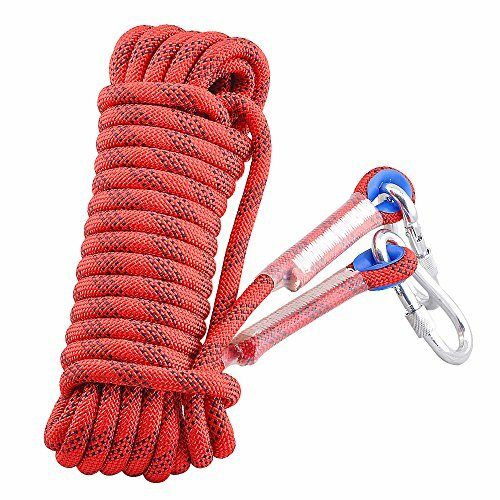 Widely Application This rope is strong, and wonderful for magnet fishing, escape, ice climbing gear, fire survival, rescue, camping, hiking, boating! Coils nicely in the hand. 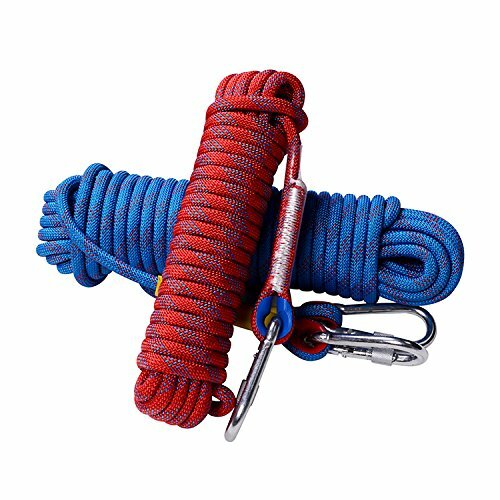 Climbing Rope & Carabiner The rappelling rope came with Stainless Steel D-ring Locking Carabiner. Diameter:1/4 (6mm); Length: 65FT (20M); Max tenssile force :550 Pounds (250kg). 100% Satisfaction Guaranteed Please contact us when you get the defective products. REFUND and REPLACEMENT will be offered with no question asked.